This puffy pillow, stuffed with delicious filling of poppy seed and cherries, personify puff pastry at its best. 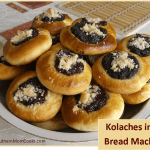 The sweet, supple dough of kolache, processed with a bread machine, pairs perfectly with the couple of fillings to create a drool-worthy outcome – ‘one-of-a-kind’ pastry worth trying at least once in a lifetime. So, all you need is a little patience while making kolaches and you will soon be the proud creator of a lip-smacking portable dessert or snack which everybody will rave for! 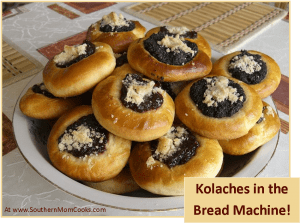 Kolaches in a bread machine - yes, really! Place the flour, mashed potato flakes, softened butter, sugar, yeast, egg yolk, milk powder and a dash of salt in the pan of a bread machine. Crack the egg into it, followed splashes of warm water and set the dough cycle before running the machine to mix the ingredients together to form a dough; knead in another tbsp or two of water after 5 minutes of processing the ingredients if required. Scoop out 1 tablespoon-worth of dollops of dough onto a cookie sheet, greased previously with a knob of softened butter, and cover them loosely with a plastic sheet. Set aside in a warm spot for an hour to allow them rise to twice their previous size. Flatten them out between the palms of your hands and make a small well in the centre of each dough ball, using your thumb. Spoon a tbsp of the filling into the well of each dough ball and set them aside, covered, for another half an hour to raise again. Meanwhile, warm up the oven to 375 degrees F.
Bake the pastries for 13-15 minutes or until they are just browned. Smother them with a lashing of melted butter to glaze and set aside until they cool down to room temperature. 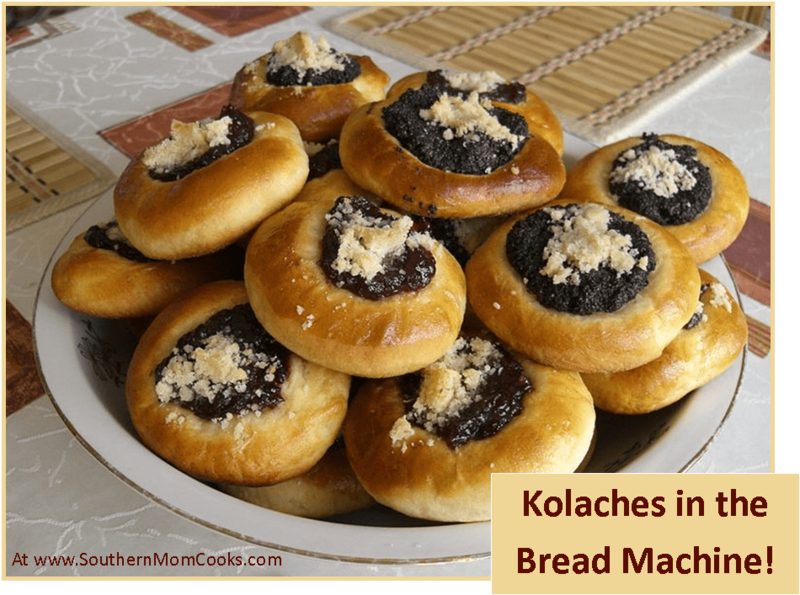 Kolaches will amaze you with their versatility! Swap the sweet pie filling with a savory one, say, sausages, cheese or ground meat and turn your favorite dessert into an equally appealing appetizer.